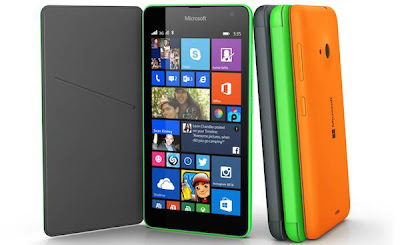 Following teasers and leaks, Microsoft has officially unveiled its first smartphone without Nokia branding - Lumia 535. The smartphone will be available in dual-sim and single sim variants from November at an estimated price of 110 euros (Rs 8,400 approximately) (excluding taxes and subsidies) with sales starting in China, Hong Kong and Bangladesh. There's no information on the India pricing and release of the phone. Lumia 535 looks similar to Lumia 530 which was unveiled earlier this year, complete with rounded corners and a coloured back cover. However, it does not sport any Nokia branding. Also, Microsoft has tried to fill in some gaps to make it more feature complete. For instance, the phone has a 5MP front camera for selfies and Skype calls and an LED flash at the back to take low-light photos. It also has 1GB RAM unlike the Lumia 530 which was unable to run games that demanded more memory. Lumia 535 sports a 5-inch qHD (960x540p, 220ppi) IPS LCD display with Corning Gorilla Glass 3. The phone is powered by a 1.2GHz Qualcomm Snapdragon 200 quad-core processor and 1GB RAM. It comes with 8GB internal storage and supports microSD card slots of up to 128GB for expansion. The phone has a 1905mAh battery. The smartphone runs Windows Phone 8.1 with Lumia Denim update and supports Cortana voice assistant, depending on the region. Lumia 535 sports a 5MP rear camera (1/4 inch sensor, f/2.4 aperture and 28mm focal length) with auto-focus and LED flash and a 5MP front-facing camera for selfie fans. It can shoot video at 848x480p resolution. In terms of connectivity, the phone offers 3G, Wi-Fi, Bluetooth 4.0 and A-GPS. Microsoft Lumia 535 will be available in cyan, bright green, bright orange, white, dark grey, and black colour options.